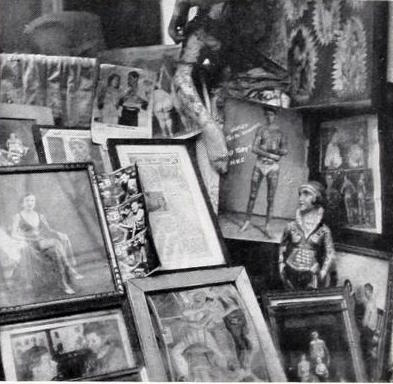 The recent discovery of a painted trade figure, however, offers renewed hope to collectors and enthusiasts of tattoo history. The figure first crossed my path in the summer of 2012 when it came up for sale at Northeast Auctions in Portsmouth, New Hampshire. It was identified as English, though the patriotic tattoo designs and elaborate angel back piece looked distinctly American. Further sleuthing confirmed an American origin. 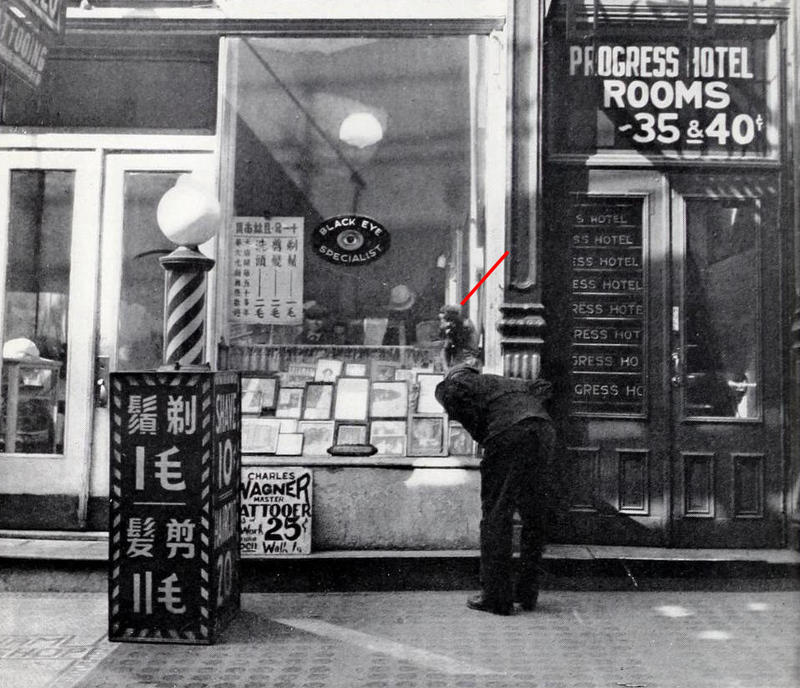 A photograph taken by Cecil Beaton around 1938 shows the figure displayed prominently in the window of 11 Chatham Square. 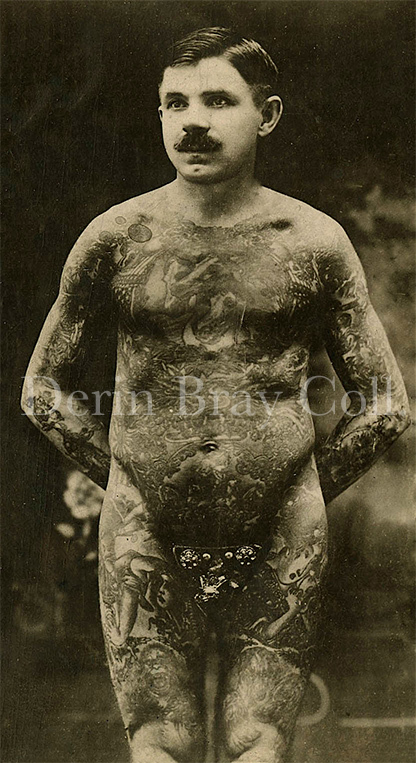 Still, Wagner’s tattooed figure presents more questions than answers. Who made it? Who painted it? How did it survive? No names, dates, initials, or other clues are inscribed on the papier-mâché surface. The wooden base, however, provides evidence of another kind. A hole and channel cut into the underside once accommodated electrical wiring, an indication that the figure had served as a lamp. A folded letter nailed to the underside of the base offers another possible clue. Postmarked 1912, the letter contains a list of recently elected officers for a fraternal lodge in Portland, Oregon. The reverse is inscribed in green grease pencil; although mostly illegible, one of the words appears to be “Theater.” Curiously, the president of the lodge, George L. Baker, was a local mover-and-shaker and owner of the Baker Theater in downtown Portland. Perhaps Baker used the figure as a stage prop or decoration for his theater. How it acquired its tattoos and traveled to New York City is still a mystery. Several Portland tattooers from that era include Charles “Red” Gibbons, Hugo Spitzer, George Fosdick, Sailor Gus Franso. For more information on Wagner, see Michael McCabe, New York City Tattoo: The Oral History of an Urban Art and The Life & Times: Charlie Wagner, published by the Tattoo Archive. The figure first sold at Northeast Auctions, August 20, 2005, lot 957; it was catalogued as English and had once belonged to the esteemed militaria dealer E. Norman Flayderman. It sold again at Northeast Auctions, August 11, 2012, lot 670. See Cecil Beaton, Cecil Beaton’s New York (J. B. Lippincott Co; New York, 1938). “In New York” by Gilbert Swan, The Olean Evening Times (May 11, 1931): 13. Albert Parry, Tattoo: Secrets of a Strange Art (1933).